Established in 1959, Wexford Creamery is located just south of Dublin in County Wexford, ,A.K.A. Ireland’s “Sunny Southeast.” Since more sunshine graces this county than any other in Ireland, cows are able to graze the lush, green Wexford pastures for 10 months out of the year. 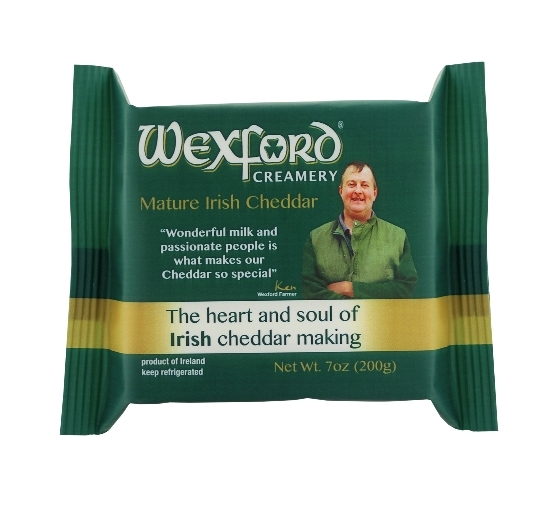 Wexford’s award-winning traditional Irish Cheddar is derived from a single recipe and made solely from locally sourced, free-range, Friesian cow’s milk, which is recognized as some of the creamiest milk found on the Emerald Isle. 80% farmer owned, Wexford Creamery’s labels feature “Farmer Ken,” to represent the creamery’s extraordinary relationships with area farmers and their passionate dedication to quality and consistency. Awarded the Kerrygold Cup for being “Best Irish Mature” and taking Gold in Nantwich’s Extra Mature Category, among many other top honors, 12 month aged Wexford Mature Cheddar is smooth bodied with a full, rich flavor and a hint of Irish sweetness. Application: A great addition to any cheeseboard, Wexford’s sharp taste goes well with chutney, adds wonderful flavor to cooked dishes like mac and cheese, pizza and casseroles, is perfect sliced on sandwiches, grilled on burgers or grated over salads. Pairing: What better than a pint of Irish stout, but a crisp white wine like Sauvignon Blanc will also work very well. Legend says tapenade originated in the South of France where, in Provence, caper plants were known as tapeneï and tapeno was the old Provençal word used for the berries. When farmers preserved the tapeno in tightly packed jugs of olive oil they became crushed together in a paste, forming the basis for the first tapenade. Today this popular dish is found all over the world with a diverse ingredient list. 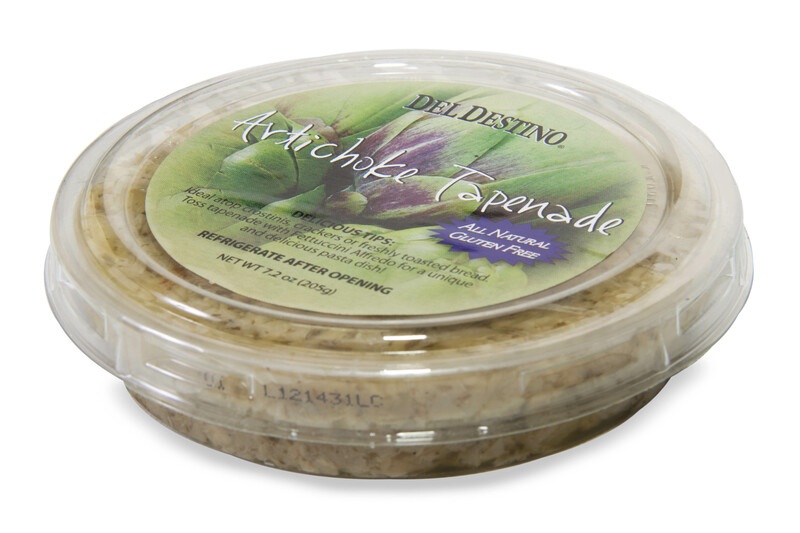 Del Destino Artichokes Tapenade is prepared from a perfectly balanced blend of artichokes, sunflower oil, herbs and spices. Delicious simply spread on crackers or artisan bread, Del Destino Artichokes Tapenade is a great marinade or topping for grilled filet or chicken breast. It can also be served with vegetables, fish, as a baked potato topping, in pasta sauce or to add a bit of Mediterranean taste to sandwiches.